Industrial style often incorporates a certain degree of whimsy, usually some design flourish that evolved from production technology improving. 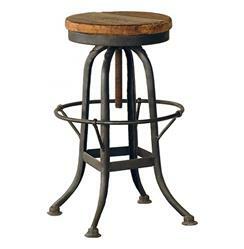 Cast iron Corinthian columns are a great example, and so is the base of this reclaimed wood counter stool: frame of iron has elegantly curved legs and a circular accent not unlike a basket. Best used at counter height between 25"-28" in height. When raised to highest point, seat may be slightly unstable.